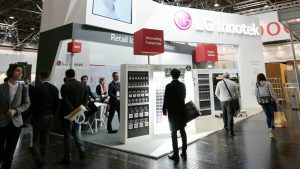 LG Innotek today announced it is participating in Euroshop 2017, the world’s biggest retail trade fair, held in Dusseldorf, Germany from Mar. 5 to Mar. 9. The company aims to attract retail companies by showcasing various products and technologies such as the world’s first commercialized ESL based color lighting control solution and advanced location tracking solution, which can be developed into a “Smart Integrated Retail Management” platform by combining distribution with lnternet of Things (IoT). This year’s Euroshop marks its 18th exhibition. This is the world’s biggest retail trade fair that receives participations from 2,500 distribution companies from about 60 countries around the world, and a total of around 110,000 visitors. The ESL based color lighting control solution, which LG Innotek is introducing for the first time in the world, automatically provides a colored lighting that is suitable for a product’s sale, based on the product barcode registered in ESL. This solution of a new concept, by its merge with ESL, overcomes the limit of the previously developed wireless lighting control system. Traditionally, retailers had to purchase and install separate lighting control solution, and even configure the settings themselves for products’ lighting control. The company will also exhibit an advanced location tracking solution that makes it easy to find product location or trace movement flows of customers inside a store. LG Innotek improved the tracking accuracy of the solution up to 50%. The company also plans to showcase a lineup of other ESL products that boost the convenience of distribution businesses and store managers, including a full-colored LCD ESL and a reflective colored ESL without backlight powered only by batteries. LG Innotek intends to meet the various needs of distribution businesses through this exhibition, by presenting products that combine its world-class wireless communication technology with its display technology. Also, the company plans to highlight its ability to provide a comprehensive lineup of various loT products, including sensor, LED lighting, and network security camera. LG Innotek will be available for meetings at Euroshop at booth A27 at the Hall 2.